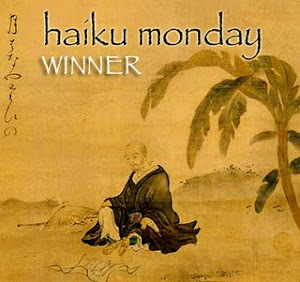 I am your host for this week’s Haiku Monday. Thank you Aunty Belle for crowning me the winner for "New Beginnings". I feel lucky, happy, and honored all at the same time!! I am very excited to host this week’s challenge! …occurring in or relating to the night. Last but not least! The winner gets a Browning Pro Hunter Escape Headlamp – to help you find your way in the dark! I AM a Scout after all. Here’s a Haiku to get us started. What was that? Who’s there? Here’s a photo from the remake of the 1985 film, Fright Night. The movie is set in Las Vegas and is about a teenager who discovers that his neighbor is a vampire. I don’t watch scary movies anymore; however, Colin Farrell is dreamy. Heh--luv that PRIZE!! Hilarious--fantastic theme. Ooooo....an early entry from none other than the Queen! I am so thrilled that you are playing this week! You do love your peace dear Queen. Thank you for your wonderful entry!!!!! Curmungeon liked the haiku I put on his blog and suggested I send it to you and this contest. It is from my historical fantasy, RITES OF PASSAGE, a fantasy Titanic of sorts about the Bermuda Triangle in 1853. I reach to touch the moon. Hope you liked it just to do Curmudgeon proud, Roland -- you have a new follower, me. The syllables are off in English, but not in the original Japanese, but those words would have made no sense to most, right? LOL. Roland, it's beautiful. I felt heartbroken myself for this heroine! I think I have been there a time or two myself! Thanks Curmudgeon for sending Roland over! The more the merrier! Wind blows. A branch groans. In silence he pounced on her. Mom? Can I sleep here? Will the griz bear call? Thanks for hosting, great theme. Wow, y'all are ambitious! I'm still back there staring at Colin Farrell and wondering why in the heck he won't return my phone calls . . . I reach to touch the chill moon. This one is for free. and pry dark from my locked eyes. I decided to add a haiku to my sunset photo from a couple days ago. Moi and Boxer: it's not Haiku Thursday through Monday?? Well, this is my first time hosting....the possibility exists for things to get messy! Hahahahahahaha. See you guys on Monday!! Scout: Congratulations on your win. Back soon. Working graveyard shift . . . If you're easily offended, skip it. I warned you. I'm UP with two for consideration. A small pile of scales and bones. Yes, I know raccoons are diurnal but they're pretty close to truly nocturnal around here. And I like to feed them fish. They attack the fish with what appears to be frenzied savagery, but they leave an intact skeleton behind. The second one is a reference to vampires. The reason for the second haiku can be found on my blog. Visuals can also be found there. Roland: Nice redo to fit into the correct syllable count! Curm: love how you captured the scene with a frightened child! Takes me back to when I was young, as I WAS that kid!! Serendipity: the visuals are great on your site! You were victorious in your moon hunt! Nice work. Dutch boy: you took the theme and turned it into a stolen moment with your sweetie - loved that!! Czar: night shifts have a lot of kinks...but I never thought about the drink after work...take it when you can get it I suppose! On the second poem, I am digging the starlit dance visual! To Troll - those little guys have some pretty skilled hands to leave a whole fish skeleton intact!! That's amazing. As for your second submission - the visuals on your site helped me out here. Great job in saying so much with so few words!! You hit the second and third lines with one word each. Well played! Csar, just what I would expect from you...so contrary! Here's some effort from me, thanks for hosting! "Woop woop woooooo," they cry. extra make-up and lip gloss. keeps me up all night. But for Pam and Chickory, I'm calling my Haiku: HENWY! her silent shadow preys; strike! I know that was you. that prize is sooooo you! who is the Dutch Boy? Im am wondering do i know this person in the real? I dont envy your job Scout - so many good haiku. @Chickory: I've got the cure for Perpetual Haiku Day: Hangover Tuesday and Wednesday, and post the winner on Thursday. Scout--oh mah grascious, Chile--this is one tough field ya got goin'--thar's some real keepers in this. Oh, boy, Scout. You already have your work cut out. And you still have tomorrow for entries! This really is a great theme - great turnout. It is always fun to see the different perspectives everyone brings to the same theme. Good luck with the judging. Any more? I think Yuk yuk and hee hee are still open. I love these laughs. 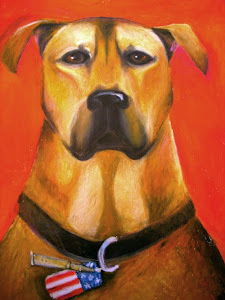 Like that first haiku on of both Chickory and Pam I like Boxer's a lot but I love puppies. last arms of the sun. Up with visuals . . . Caught out at dusk? Duck! Holy Cannoli! I paid no attention to how many haikus were already here when I posted last night (sleepy was I). @czar I was one of those graveyard shift peeps years ago occasionally sipping a toddy at 7 am. It was our evening/end of day. Made sense to us. I decided to try my hand yet again! I'm up ... with a visual. Dark night of my soul. Man I thought I was two or three till I started reading these. Difficult week. looks like everyone went all out! I am so happy that everyone came out to play! We've still got time and room in the sandbox!! Happy Haiku Monday everyone!! P.S. Congrats to you and the others for your wins these last couple weeks! Thank you for hosting. You've got quite a turnout. Day or night, who knows. In this water bring your own light. Too deep for the sun. @Czar: Nothing quite like standing in line at 7-11 with a six pack in your hand at 07:00. You know you just got off work, but all the suits standing around you don't. I have a visual at The Buzzkill. Sorry I'm late - I forgot to auto-publish. Thanks for hostessing. Scout is really in for it. It may take days before we know the winner on this one! I want to join in the Haiku Monday crowd--I came from the Chicory blog, and Aunty Belle and I used to get into some fine talks about John Locke and natural rights. Seeing Colin Farrell made me think of Tigerland. God bless our men and women in uniform. Last comments before I put up a pre-winner announcement recap!! Fleur: nice spin on the teenager vampire craze! The road to Hell is paved with good intentions?! Chickory: Dutch Boy is also known as “Scout’s Daddy”! Guess he and his love conceived something at SOME point eh? My Dad is a true romantic – didn’t surprise me that he took lover’s lane to Haiku land. You provide us with two GREAT Haiku featuring the Owl – the visual on your site is stunning. I know Mama is watching over you honey. Moi: in my childhood Virginia, we used to stand outside under the streetlights and try to attract bats by throwing rocks up in the air. Why? Probably because we didn’t have Xbox or cable back then…better days I’d say! Rafael’s got a great visual on his site – yall should go check it out! Karl – great effort! IN your first one, I’m thinking Scuba, yes? Fishy – not a lot of sleep going on in your house – I feel for you. But you still delivered two great Haiku!! Love the line on the second…..”Savagery denied”….indeed! And Aunty! You exposed two extreme views on the topic – on the one side we have shrieking furies, and on the other we have prayers and peace! Well done!! Great visuals on your site too!